Actress Kate Winslet is set to play war photographer Lee Miller in a new film, according to press reports. The movie will be based on Penrose’s biography, The Lives of Lee Miller. The news comes on the day a new exhibition of Miller’s work opens at the Imperial War Museum in London. ‘Lee Miller: A Woman’s War’ features 150 photos depicting women’s experiences of the Second World War – with many images on show for the first time. ‘Miller’s most important legacy is without doubt her photography of the Second World War,’ said Hilary Roberts, research curator of photography at the Imperial War Museum where the show will run until 24 April 2016. Split into four parts, the exhibition traces Miller’s career as a photographer for Vogue magazine – covering women in Britain before the war, wartime Britain and women in wartime Europe – the latter focusing on her coverage of the impact of war on women in Europe as an official war correspondent for Vogue. The last section of the show is devoted to women after the war. Also on display are artworks, costumes and documents. 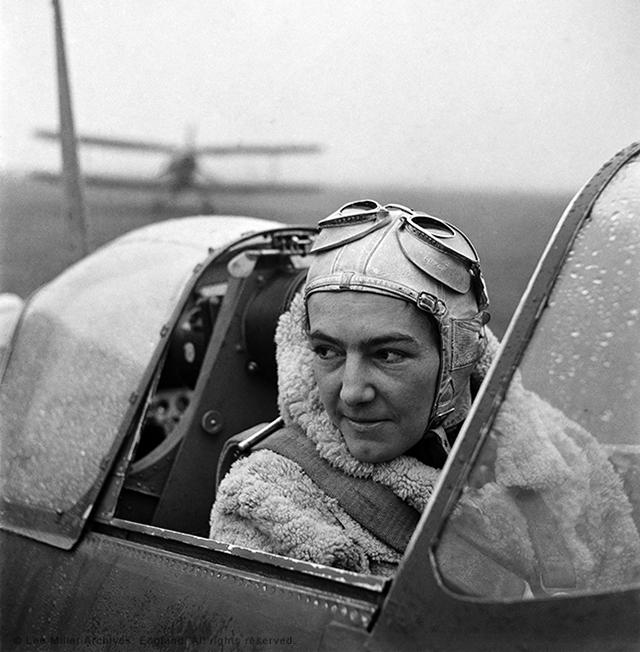 Anna Leska, Air Transport Auxilliary, Polish pilot flying a Spitfire, England, 1942. © Lee Miller Archives; All rights reserved. Miller was also a fashion and celebrity photographer. Earlier this year, her 36-year friendship with Pablo Picasso was explored in a separate exhibition at the Scottish National Gallery in Edinburgh. The New York-born photographer first met Picasso in 1937 and the relationship continued until the artist’s death in 1973. After moving to Paris in 1929, Miller spent three years working with photographer Man Ray as his model, muse and studio assistant. Miller became a war correspondent for Vogue in 1942. Sixty thousand of Miller’s images were found in the attic at her Sussex farmhouse after the photographer’s death in 1977. To view Lee Miller’s work, visit www.leemiller.co.uk. For details of the exhibition, visit www.iwm.org.uk.